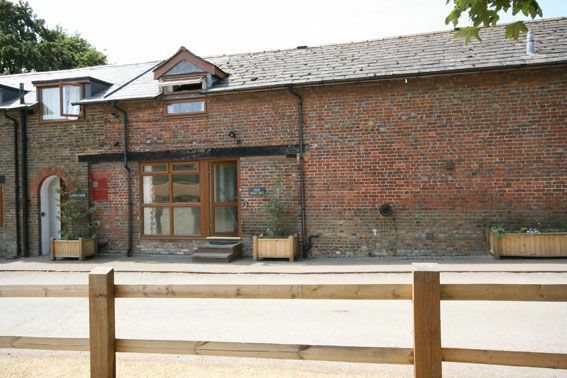 The Old Stables is one of seventeen holiday cottages at Town Farm, on the edge of the Chilterns. We are a working arable farm, with some sheep over the surrounding hills, we are lucky to have views over to Ivinghoe Beacon on one side, and Aylesbury Vale on the other. All the cottages each have their own unique charm, and we also run a campsite during the summer months. The `Pick Your Own` opens in June and guests can take a picnic and stock up on fruit and vegetables - this is a five minute drive away. It is only a ten minute drive to Tring Railway Station, shops and facilities, or a ten minute walk to Ivinghoe village, with pub, shop and tea room. London Euston is a 40 minute train ride from Tring Station. The serviced accommodation comprises a two storey property with an open plan living area, large kitchen and three bedrooms (one double and two twins). The front door opens on to the open plan sitting and dining area. The sitting area has comfortable sofas, flat screen TV and DVD player. The dining area has a large table with six dining chairs. The sitting area has a large picture window with views over Ivinghoe Beacon. The kitchen is fully equipped with cooker, microwave, fridge, freezer, dishwasher, washing machine and tumble dryer. There is a large pine dining table which comfortably seats six. Access to the enclosed patio area from the kitchen. Upstairs the three bedrooms comprise a one double, a twin and a single, with wardrobes and chest of drawers. The bathroom includes an over bath power shower. The property benefits from full oil central heating. The property has access to a tennis court available to hire, games room and a children`s play area on the farm. Parking for two cars is available at the front of the property. Up to two pets are welcome in the property, please let us know on booking. Wi-fi is included in the rental. `We all really enjoyed our stay with you at The Old Stables, Town Farm. We really would have no hesitation in booking with you again. The accommodation was excellent. I would like to thank Angie and the team for all your help in arranging the accommodation at such short notice - it was very greatly appreciated. The booking process, check-in and welcome was excellent and I would not hesitate to recommend staying with you to others.` - Joyce W.
The family bathroom has a bath tub with shower over.